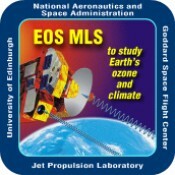 ML1OA is the EOS Aura Microwave Limb Sounder (MLS) product containing the level 1 orbit attitude and tangent point geolocation data. The data version is 3.3/3.4. Data coverage is from August 8, 2004 to June 30, 2015. Spatial coverage is near-global (-82 degrees to +82 degrees latitude), and files contain a full days worth of data (15 orbits). Users of the ML1OA data product should read the 'A Short Guide to the Use and Interpretation of v3.3/v3.4 Level 1 Data' document for additional information. The data are stored in the version 5 Hierarchical Data Format, or HDF-5. Each file contains orbital and attitude information written as HDF-5 dataset objects (n-dimensional arrays), along with file attributes and metadata.